Sabancı University, as a part of the UN Joint Program "Promoting and Protecting Women's and Girls' Human Rights", in which Sabancı University, Sabancı Foundation, Ministry of Internal Affairs and United Nations Population Fund (UNFPA) have been contributing, has hosted the third Purple Certificate Program in June, 30 – July, 4, 2009. During the academic year, academicians from Sabancı University have visited the project cities; İzmir, Kars, Nevşehir, Şanlıurfa, Trabzon and Van, in order to organize meetings with high school teachers, about gender and education. After these meetings, 69 high school teachers, who were willing to explore the subject in depth, were invited to Sabancı University. 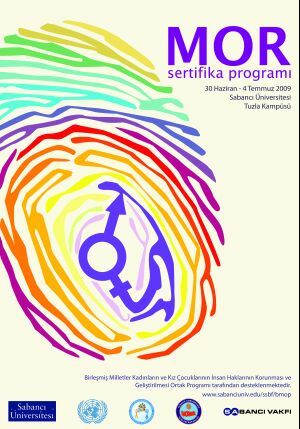 In the third Purple Certificate Program, which was held in June, 30 – July 4, 2009 on Sabancı University’s Tuzla Campus, academicians both from Sabancı University and other universities have shared their knowledge on the subject. With the contribution of representatives from NGO’s and press associations, subjects such as; gender, women’s rights, gender equality in education and school textbooks, violence against women and sexism in the press were discussed in the meetings. Along with the meetings during the day, several activities such as; film screening, theatre and colleague gatherings were held in the evenings.